Introduction: Prairie Grove was the battlefield where 22,000 men from the Union Army of the Frontier and Confederate Army of the Trans-Mississippi fought on December 7, 1862. After a day of combat, a shortage of ammunition and food forced the Confederate army to retreat during the night. More than two thousand men would be killed, wounded, or missing during the battle. While Prairie Grove was a tactical draw, it was a strategic Union victory. This was the last major battle in northwest Arkansas. Summary: Maj. Gen. Thomas C. Hindman sought to destroy Brig. Gen. Francis Herron’s and Brig. Gen. James Blunt’s divisions before they joined forces. Hindman placed his large force between the two Union divisions, turning on Herron first and routing his cavalry. As Hindman pursued the cavalry, he met Herron’s infantry which pushed him back. 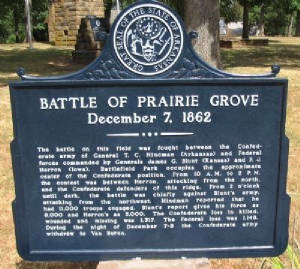 The Rebels then established their line of battle on a wooded high ridge northeast of Prairie Grove Church. Herron brought his artillery across the Illinois River and initiated an artillery duel. The Union troops assaulted twice and were repulsed. The Confederates counterattacked, were halted by Union canister, and then moved forward again. Just when it looked as if the Rebel attack would roll up Herron’s troops, Blunt’s men assailed the Confederate left flank. As night came, neither side had won, but Hindman retreated to Van Buren. Hindman’s retreat established Federal control of northwest Arkansas. See also Arkansas Civil War History. Today: Prairie Grove is recognized nationally as one of America's most intact Civil War battlefields. Prairie Grove Battlefield State Park currently protects the battle site and interprets the Battle of Prairie Grove, where on December 7, 1862, the Confederate Army of the Trans-Mississippi clashed with the Union Army of the Frontier resulting in more than 2,500 casualties. This marked the last major Civil War engagement in northwest Arkansas. See also Battle of Prairie Grove: Setting the Stage. Notes: General Joseph Shelby (December 12, 1830 – February 13, 1897) was a Confederate cavalry general in the Trans-Mississippi Theater during war. Quantrill's Raiders, which included the likes of Frank and Jesse James and James and Cole Younger, was credited for saving General Shelby from capture during the Battle of Prairie Grove. Guerrilla "Bloody Bill" Anderson would join Quantrill's Raiders the following year. Sources: National Park Service; Official Records of the Union and Confederate Armies; Library of Congress; The Arkansas Department of Parks and Tourism. Shea provides a colorful account of a grueling campaign that lasted five months and covered hundreds of miles of rugged Ozark terrain. In a fascinating analysis of the personal, geographical, and strategic elements that led to the fateful clash in northwest Arkansas, he describes a campaign notable for rapid marching, bold movements, hard fighting, and the most remarkable raid of the Civil War. After months of intricate maneuvering punctuated by five battles in three states, armies led by Thomas C. Hindman and James G. Blunt met one last time at Prairie Grove. The costly daylong struggle was a tactical draw but a key strategic victory for the Union, as the Confederates never again seriously attempted to recover Missouri or threaten Kansas. Historians have long ignored the complex campaign that ended in such spectacular fashion at Prairie Grove, but it is at last brought to life in these pages. From the Inside Flap: Shea offers a gripping narrative of the events surrounding Prairie Grove, Arkansas, one of the great unsung battles of the Civil War that effectively ended Confederate offensive operations west of the Mississippi River. Shea provides a colorful account of a grueling campaign that lasted five months and covered hundreds of miles of rugged Ozark terrain. In a fascinating analysis of the personal, geographical, and strategic elements that led to the fateful clash in northwest Arkansas, he describes a campaign notable for rapid marching, bold movements, hard fighting, and the most remarkable raid of the Civil War. About the Author: William L. Shea is professor of history at the University of Arkansas at Monticello. He is coauthor of several books, including Pea Ridge: Civil War Campaign in the West (UNC Press) and Vicksburg Is the Key: The Struggle for the Mississippi River. With numerous maps and illustrations that enhance the authors’ descriptions of what happened at each stop, the book also includes analytical accounts explaining tactical problems associated with each battle as well as vignettes evoking for readers the personal experience of those who fought there. An indispensable companion for the battlefield visitor, this guide offers not only touring information and driving tours of sites associated with the campaigns that led to the battles, but also a brief history of each battle and an overview of the larger strategy and tactics of the military action in which these battles figured. The Southern commander, Earl van Dorn, the authors maintain, was a swashbuckler out of his depth--particularly in light of the administrative weaknesses of the trans-Mississippi Confederacy. Their detailed analysis of the climactic battle impressively conveys the difficulties of the improvised armies that groped for and grappled with each other in the Civil War West. From Library Journal: The battle of Pea Ridge, fought in northwestern Arkansas in March 1862, was probably the most important trans-Mississippi battle of the Civil War. It was unusual in the use of Indian troops and in the Confederates' numerical superiority, better supplies, and inferior leadership. The battle ended any serious Confederate threat to Missouri and opened the Union's path into Arkansas. The book offers the rich tactical detail, maps, and order of battle that military scholars love but retains a very readable style combined with liberal use of recollections of the troops and leaders involved… This is an important book for academic libraries and for public libraries in the region. From the Back Cover: Praise for Glenn Dedmondt's previous books: "A meticulously detailed resource offering very specific information for history and Civil War buffs, The Flags of Civil War North Carolina, is a welcome contribution to the growing library of Civil War studies and could very well serve as a template for similar volumes." --The Midwest Book Review. "A good effort that serves to explain the flags these men fought for." --Blue & Gray Magazine. "Colorful and well illustrated, and contains much information about each flag." --The Civil War News. On May 6, 1861, representatives from Arkansas voted to dissolve their ties with the government in Washington, D.C., feeling that Arkansas belonged with her Southern brothers. Arkansas furnished 65,000 men to serve in defense of the South, nearly its entire male population. The flags in this work are the symbols of the sacrifices and strengths of these men from the Land of Opportunity. Despite the large number of companies outfitted in Arkansas, surprisingly few of their flags survive. As a result of detailed research into archived newspapers and other contemporaneous accounts, the author provides here, for the first time, a nearly exhaustive study of the flags and the men who proudly carried them. From the Bonnie Blue Flag, the unofficial state flag of secession in Arkansas, to the First National flag of the Confederate States and the numerous other company and regimental flags the men of Arkansas bore into battle, each banner is presented in full color, accompanied by a history of its unit and creation. Other books in this series include The Flags of the Confederacy: An Illustrated History, The Flags of the Union: An Illustrated History, Flags of Louisiana, Flags of Tennessee, and Flags of Texas, all published by Pelican. Recommended Reading: With Fire and Sword: Arkansas, 1861-1874 (Histories of Arkansas). Description: Thoughtfully written by Thomas A. DeBlack (Associate Professor of History, Arkansas Tech University), With Fire And Sword: Arkansas, 1861-1874 provides a scholarly examination of just how the events of the Civil War and the Reconstruction so heavily devastated the state of Arkansas, its population and its economy, that this southern state was never to fully regained the level of prosperity it had enjoyed prior to the war. A candid and detailed retracing of crucial decisions, their interplay, and their lasting legacy, With Fire And Sword is a welcome contribution to the growing library of Civil War literature and Reconstruction Era reference collections and reading lists. Scholars will want to go elsewhere for more exhaustive research, but the lay reader interested in the area should enjoy this title. A chapter on buried treasure and weapons in the Ozarks whets the appetite for more. The narrative is laced with potboiler adjectives and occasional bias (Yankees are bad, Confederates are good), but that's part of the fun. Several photographs are credited as reenactments. For regional collections. Since its original printing, this firsthand account has only been reprinted once, in 1957, and both editions are considered collectors' items today. Of interest to Civil War scholars and general readers alike, Baxter's compelling social history is rendered even more comprehensive by William Shea's introduction. Pea Ridge and Prairie Grove is a valuable personal account of the Civil War in the Trans-Mississippi West which enables us to better comprehend the conflict as a whole and its devastating affect on the general populace of the war-torn portions of the country.